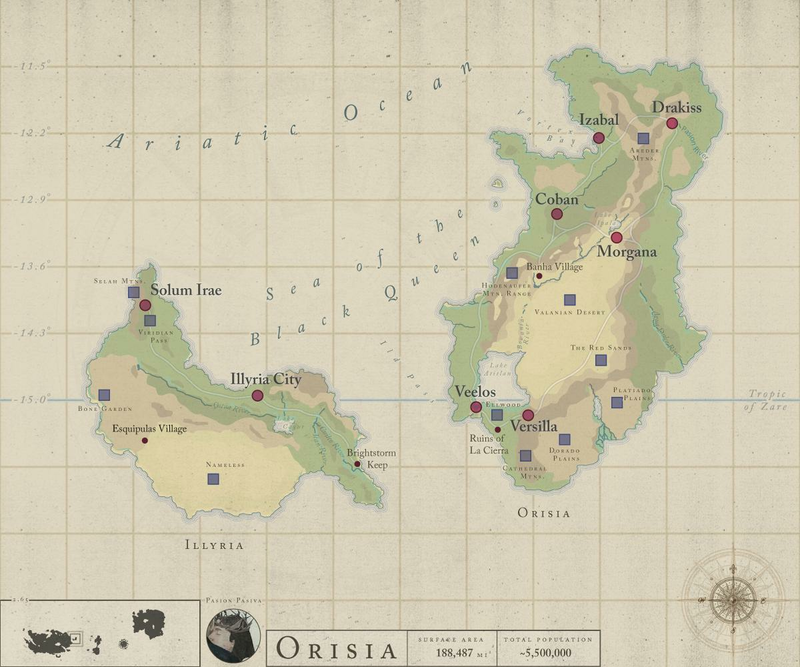 Orisia is an island with a long and tragic history. In the ancient days, the island enjoyed a golden age of peace that could be attributed to its lack of dealings with the mainland. Well aware of Genesaris’ existence, the people of Orisia opted for a quiet and isolated life, enjoying all that their secret paradise had to offer. There was a subtle magic in the land—a sort of ethereal presence that enveloped absolutely everything. Without any true understanding of what it was, or why it existed, the magic was never given an official name. Referenced to only as La’Ruta (The Path), it simply existed and extended out from the earth to the trees, to the beasts and the people. The Orisians were touched by it, and in turn became beings of unimaginable patience and virtue. Those who believed in living according to the unstated laws that command La’Ruta did not institutionalize their beliefs until much later in Orisia’s history. This magic was utterly impossible to grasp, and its followers accepted this fact fully. It was enough to be surrounded by the miracles provided, to merely marvel at the pure and perfect essence. Attracting a number of mythical creatures, desperately in search of a safe haven, which they immediately found in the fiercely guarded island. These creatures, both noble and fearsome, were regarded with respect and granted a position of honor upon the Orisia’s sister island Ceyana, for their presence was a testament to the magic that seemed to thrum it's call to the rest of the known world. La'Ruta is said to have come from Genesaris itself, but it has not been felt in the mainland for many hundreds of years. For some time that same magic seemed lost to Orisia as well. Drawn by the rare breeds of creatures and a taste for their blood, a dark and horrible creature came to the lands. Areder DuGrace came with powers of distorted darkness the likes of which no Orisian had ever seen or could hope to understand. No one was safe from this creature, for he used the very shadows cast by the innocents to enslave them. So vicious and malevolent was Areder’s powers that the Orisian people, having grown soft due to their time bathed in the peaceful presence of La’Ruta did not know how to react. Those who opposed him were thrown into the abyss, where a fate worse than death awaited them—an eternity of night. Areder seemed to drain the very life of the land once he drank of the blood of both man and beast. When it seemed that he would waste away the divine spark that made Orisia so special, a champion arose from the devastation to challenge the fiend and to slay him; a man named Aulden. It was a fierce battle—one that changed the face of Orisia forever. Meeting upon the place where the modern-day Areder Mountains are located, these polar opposites met with the sole desire to undo the other. The clash was unlike anything the island and its people had ever encountered. While there were no witnesses to the epic fight, every man, woman, and child felt its progression and eventual outcome. The earth trembled with the force of their swords as they clashed, and when at last Aulden bested the horrible monster and spilled his blood upon the ground all of the magic he had stolen spilt back into the earth. So concentrated was the power Areder had ingested that it burned into the very ground upon which they had met, and from it—like the seeds of creation, the soft hills were ripped open and from them birthed a treacherous mountain range. Raw rock was exposed, jagged, beautiful, and bleeding, in the form of red-hot molten magma. Unfortunately, Aulden did not escape the battle unhurt. Having suffered serious injuries he lived only long enough to be returned to his place of birth among The Cathedral Mountains. There his body was laid to rest, and the city of his birth renamed, in his honor, to Aulden’s Gate. The magic of the land suffered and grew quiet after that battle. Only the most devout followers of La’Ruta were able to hear or feel it. As it regressed, growing weaker and quieter, so did the Orisian’s memory of all that they had learned. From generation to generation, theThree Treasures were often mentioned, but not seriously followed. After Areder’s death Orisia suffered greatly from the political turmoil, left in the wake of lost leadership. With Aulden’s death, Orisia lost the only individual who was capable of restoring peace and balance to the land. Civil war after civil war between warring noble families further weakened the population, until finally, some three hundred years after Areder and Aulden’s death, the House of Beauchene finally secured the throne. For two hundred years this Royal Family squandered the resources of the island, living in excess and luxury while the people suffered in crippling poverty. Orisia became a cesspit of crime and misery, crippled by two centuries of endless war and uncontrollable famine, losing two-thirds of its population throughout this period. Still, the island still managed to hold on to some of its enchantment. Its natural beauty, though marred, could not be completely undone. Sensing the decline, the creatures of myth went into hiding, with the great and diverse landscapes of Orisia seemingly to closing off from the violent touch of man. The last Beauchene family to rule, some twenty years ago, was particularly sadistic and oblivious to the plight of their people. With the mounting civil unrest, Orisia’s environment was exceptionally ripe for civil war. However, the opportunity to strike, despite preparation, never came. Back in the mainlands of Genesaris, The Great North tore through the country bloodthirsty and power-hungry. Confusion still remains as to why the Great Nation of the North set their sights upon the small and already terribly dysfunctional island. Some believe it to be punishment—cruel retribution for the loss of La’Ruta. Others saw the Great North as an omen of violent, but positive, change, like the mighty fires that cleanse the dry and dying forests. The Great North, though indiscriminate with its killings, did purge the land of all the bad blood and tilled the land, abandoning it at the last moment and leaving it fertile and ready for the seeds of transformation. With the imminent threat of forces from the mainland, no noble family rose to claim the throne, especially not after what the Beauchenes had suffered at the hands of the Northerners. Orisia fell to lawlessness and chaos. Those with enough wealth managed to buy protection, to live above and beyond the harsh conditions of the common people. For twenty years, things remained in much the same way. The Great North seemed to lose interest in the island, but criminal organizations had settled so comfortably upon the territory that it was near impossible for anyone to reclaim control. Enter the DuGrace Family. Gabriela, who had gone into torpor and had remained asleep or the better part of three hundred years, awoke to a startling revelation. Eden was gone, and somehow her tomb had been transported to a new world. A gift from Tenebre—Gabriela felt the nearby presence of the many members of her family and felt a single throbbing yearning in her heart. Her desire was to build a home—a true and lasting home for her three children. Tenebre, a profoundly powerful but unbalanced abysmal deity, had already scouted the world of Valucre and had found Orisia to be the perfect gift for his newly awakened protégé. Reluctant, at first, Gabriela was immediately won over the moment she set foot upon Orisia. 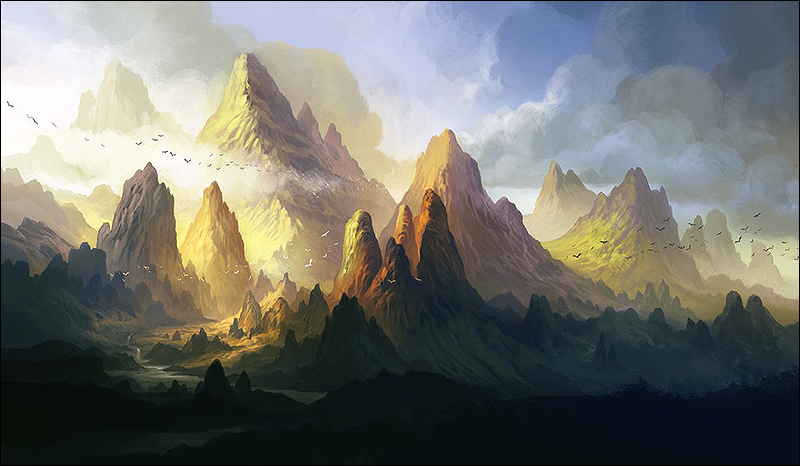 With her presence, La’Ruta seemed to finally stir from its long slumber. With no prior knowledge, Gabriela imagined the sensation that coursed through her body to merely be an unconscious reaction, one that urged her to remain, to rebuild, and to grow. Population: The joint population of the islands was last measured at around two million humans. This number does not reflect the large number of non-human peoples who call Orisia they’re home. Technology: Orisia’s technology is definitely not as advanced as other nations or cities, this may have to do with the fact that Orisia has often gone to great lengths to isolate itself from the mainland. Although the people of Orisia are highly intelligent, and place great value upon education—there is an overall sentiment that advanced technological methods of warfare cause a disconnect from the significance of life. Orisia’s technology is comparable to the European technology of the mid-1600s. Climate: Orisia is large enough to enjoy quite a range of climates. From the central white sands of the Valanian Desert to the snow peaks of The Areder Mountains and the lush near tropical forests located toward the Northern end of the Island. Orisia seems to have a little bit of everything. Overall the climate of the island tends to be warm and mild along the coasts, comparable to the Mediterranean type of weather. Commerce and Goods: With such favorable weather conditions and lots of open space, Orisia boasts one of the healthiest and most diverse agricultural settings. Orisia produces rare and delicious fruits that are traded to neighboring cities along the Easter coast of Genesaris. For the most part, Orisia is a self-contained country, with many rare and precious goods to offer such as fine lumber, precious stones and rare metals. However, Orisia has a dark side when it comes to trade—as a safe haven for mythical creatures of all kinds, the Government often finds itself combating the illegal capture and trade of endangered creatures such as unicorns, griffins, wyvern, and many more. Defenses: Orisia boasts a unique natural defense in the form of its high sheer cliffs. A majority of the island's coasts are high walls of jagged rock, easily showing how the land mass was carved out of the Genesarian mainland. The few available beaches and more assessable bays have been claimed by busy and growing port towns and cities. As centrals of commerce, these places are heavily guarded. The seas that surround both islands are patrolled by an organized and impressive naval force. It has often been said that in all the waters great and small of Valucre there are no sailors more committed to the sea than the men and women of Orisia. This sentiment is reflected in the magnificent ships, both of war and commerce, produced by Orisian shipyards. Upon land, it is The Order of the Black Heart that serves as both a source of leadership as well as military protection. Individuals who join the Order are completely committed to the protection of Orisia, its people and its interests. These are highly trained men and women who not only swear their lives in military service, but also in intellectual service. During times of peace those belonging to the Order are fully expected to continue contributing to the growth and development of Orisia. Nearly every city of Orisia houses a royal court—the number of nobles within the court depends on the size of the city. Larger cities that house one of the Noble Seven (Duke or Duchess) will automatically have a court of at least fifty nobles. All nobles (with the exception of a small number) are knights—an individual cannot be a noble, belonging to a royal court, without having sworn service to Orisia. Soldiers make up the biggest part of Orisia’s military. These are men and women, usually specialized in a specific area (Infantry, Cavalry, and Archery). Highly trained and highly paid, these men and women are committed to their country. Finally, depending on the size of a city, town, or village, a sheriff along with a number of officers is assigned. These individuals are not part of The Order of the Black Heart, but they are employed to ease the burden of enforcing Orisian laws. A sheriff (or his officers) is more than likely the individual who will show up whenever there is some minimal disturbance. Unlike a member of the Order, a sheriff (or officer) is not allowed to use deadly force (with the exception of self-defense). Instead, a sheriff will try to mediate a situation that requires an authoritative figure, and or make arrests when a situation requires it. Sheriffs and officers can, at any moment, ask for the assistance of a knight.